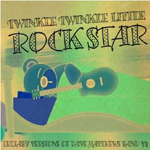 On January 15th, 2013, Twinkle Twinkle Little Rock Star released Volume 2 of Dave Matthews Band Lullabies. DMB have been given the lullaby treatment a number of times and you can check them all out in our discography section, but this is the first lullaby series to release more than one volume. This release features even the newest of DMB songs including, "Mercy", "Broken Things", "If Only" and "Sweet". The most interesting selection is "Work it Out" which comes from Jurrasic 5's album "Feedback" which Dave Matthews Band is only featured on the song. In any case, hard to imagine as a lullaby, but I guess you could say that for any of these songs. If you have a young DMB fan in training or are just curious this album is on sale now via amazon.com for $6.99 or iTunes for $7.99.